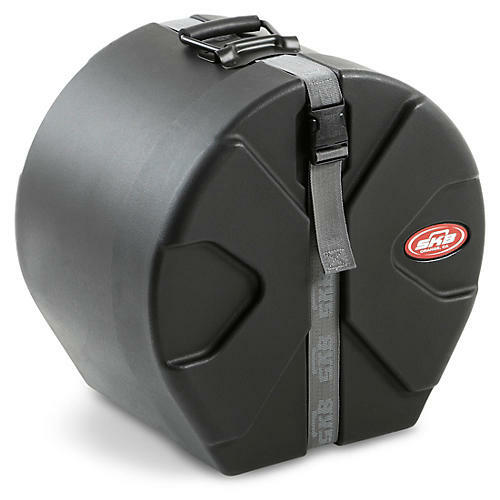 Open Box SKB Roto-X Molded Drum Case 13 x 9 in. The revolutionary SKB Roto-Molded D-shaped drum case has molded-in feet for upright positioning and stability. Patented Roto-X pattern for durability and reliable stacking. Case has sure-grip handles with a 90 stop for easy lifting and transporting of drums. Sturdy, high-tension slide-release buckle and heavy-duty web strap ensures totally reliable closure. This SKB road ready case is stackable for convenient storage. Fabric-covered foam inserts securely cradle the drum with maximum protection. SKB is our premier supplier of instrument and gear cases. SKB builds their products with military-spec, ultrahigh molecular weight polyethylene and premium hardware. All SKB hardshell cases are unconditionally guaranteed forever. That means if you break it, they will repair or replace it at no cost to you.